I've been sad recently, keida's puppy coat is starting to come off, he's about 13 weeks old now. I tried brushing him but im worried that i'll take off too much hair. I have been using the furminator since I use it for my GSD too. I noticed that after I brushed him, his fur on some parts looked super thin. Also, he's always been scratchy, scratches with his thumping foot maybe once or twice an hour and doin his shiba shake at around the same frequency. What would you guys consider scratching a lot? I dont think he has any allergies to food or what not since i've been giving him the same food for a couple weeks and nothing has really stood out. I also asked his breeder if the dam/sire have any allergies as well and she says no. I just want to make sure he's doing well during his shedding period. Furthermore, he has no skin irritation from what I can see. So my questions are : Is it too early to furminate? does itching come with shedding? and is it weird that he sheds in patches? It is NEVER a good idea to furminate a puppy... And 13 weeks is usually a little young to be shedding puppy fur, but depending on the climate where you are, it may be normal. As for the itching, Shibas do have a tendency to have allergies... Skin, inhalant, and food allergies... So if you feel he is scratching excessively, you may want to take him to the vet... Also, if you are not already doing so, you may want to switch him to a grain free food. There are a lot of Shibas with grain allergies or sensitivities. Plus, grain free is a much healthier and nutritionally appropriate food for any type of dog. Do not use the furminator on him right now, since its his first time growing his coat in, you don't want to shred the outer coat, or take out too much undercoat. All of the groomers I know refuse to use the furminator on pups, and they don't brush them as much either. My pup is loosing his fur as well (he is 13 weeks). What I do is just take him outside and rub his coat in the opposite direction it lays with my hand. This allows for the hair that is already loose to come off without me having to worry about taking any fur off prematurely. Instead of looking like he is loosing anything, he is getting fluffier as his adult fur comes in. I have been doing this on all of his walks and so far its keeping the fur out of my home. The itching is normal since its from the fur growing in, especially on their stomach were fur is growing in for the first time in some places. The dander you may be seeing is also normal. Oooh okay gotcha. Whoo, good thing I have this forum to tell me what's up. No more furminating for this little guy. I've used the furminator on him twice so far and now I'm worried I took out too much undercoat for the summer. Eek, does this have long term detrimental effects? Is it a go to the vet-worthy problem?? Ugh now i'm worried and i was even contemplating using some rogaine hair regrowth on him for a second. Thanks guys, i don't know what i'd do without ya'll. No, the hair loss from the furminator is not a vet-worthy problem, and will probably not have much of an effect at all on him (unless ALL of his undercoat is gone, then you will need to ensure that he stays out of the sun and remains cool during the hot months until it grows back in). Glad to hear I'm not the only one who has a puppy shedding early! Fortunately, after ringing around our breeder and other breeders here in Australia, we've found a lot of puppies are shedding right now. This was because the weather has suddenly changed (especially in Melbourne) and we are now into full winter mode. Very cold days. So it seems all the shiba puppies are shedding now (some as early as 12 weeks). Not sure where you are located but the breeders we called said sudden weather changes do confuse our canine companions and then tend to shed earlier/later due to these. Uh oh, we have been lightly furminating Tsumo! Once every 2 weeks or every week (when we can remember)...I think we're going to have to stop after reading this. Just have to settle with the clumps of fur rolling around our hardwood floors :P They're like mini tumbleweeds hehehe. does itching come with shedding? - yes it does, but if Keida is getting a rash, any inflammation or anything that looks like skin irritations, you should definitely consult with your vet to find a solution. and is it weird that he sheds in patches? 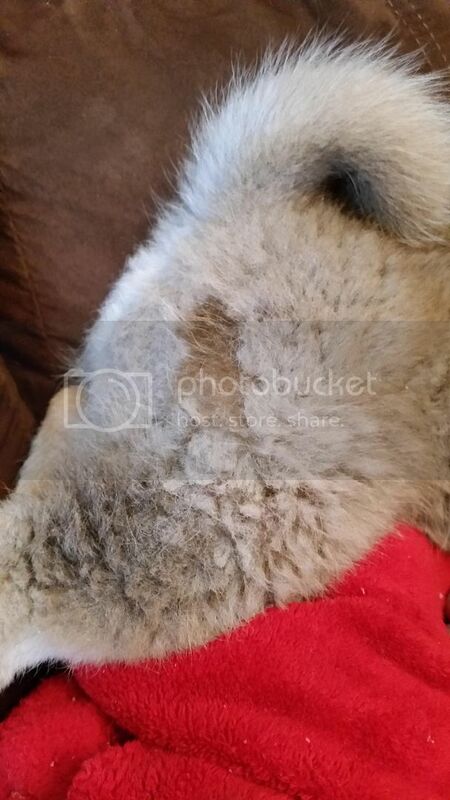 - no - the first signs of blowing their puppy coat is usual on their belly, they'll start to lose their fur in patches and grow their coarse coat in patches in this area first. As the breeder did say, if you are worried, check the patches for inflammation etc (listed above) and if it's not showing any symptoms it's probably just normal shedding. I have a 9 month shiba,Coco, is has been shedding in chunks, called the groomer and she recommended shaving him. I am not sure of that, she says because we live in florida that is the best solution. Find a new groomer. That's really bad advice. Your dog will likely suffer horribly from sunburn and risk overheating. Their coats protect against sunburn and also keep their body temperature regulated in hot and cold weather. Pino spent her puppyhood in Florida as well and never had issues with her coat. Though last time I was at the vet (last check up before I was bringing Pino from CT to AZ) we did ask about Pino's recent shedding. She seemed to be more itchy and shedding much more this year then other years and the vet wasn't surprised with our question at all. Apparently they had been getting similar questions all year, as the quick weather changes lately has caused a lot of dogs to be shedding early and more so. I'm not sure about FL, but could be a similar issue. Penny is almost 13 weeks and doing the scratch. No underlying skin eruptions, lesions, etc., no change in diet (Wellness Puppy) and her undercoat hairs are being cast off. Poor girl looking a little ragged on her flanks. The only thing that is making me think that she might be suffering an allergic reaction is that she received her first dose of Heartgard plus ~ 2 days before the scratching began. Possibly, I read its the beef flavoring they add. Anyone else with a similar experience? My boy Inu lost his puppy coat last year with no appreciable scratching that I can remember. So glad we are not the only ones. Our 15m old is shedding a very good amount of under fur. We are in NYC and winter has kicked in. Quite a bit of scratching going on here also. We have been using a wired puppy brush to gently brush him every now and then. It seems to help a little bit and I think he likes the occasional massage. And by 15m I mean 15 weeks old! Our puppy is 13 weeks and has some occasional shedding. When we notice his fur on our clothes, or coming off when we pet him, we brush him with a kong zoom groom. I guess this turns out to be about every 2-3 days, and we only brush for a few minutes. Seems to be his sides and belly that shed the most. He appears to like the massage, rolls onto his back, and the brush collects the fur quite nicely. However! the zoom groom is NOT puppy-proof! Since it's a kong product, we thought it would be tougher, and let him inspect it - within a minute he had pulled off a spike. He really liked it though, so we kinda have to brush him while he's occupied with a toy, or he wants to play with it. I use the zoom groom on Onyx too, he loves the feel of it, where he screamed when I brushed him using anything else, and it takes off a ton of hair but doesn't seem to take off any fur it shouldnt. Along the topic of this discussion.. I was hoping to pick your brains. Kira has been shedding and her coat has been thinning out considerably. We call her our little rat tail because that's what her tail looks like now. She's only 7 months old. Is this normal? Will it grow back once she's fully grown? If she's got a rat tail, I'd take her to the vet and have them run a full thyroid panel. A rat tail is one of the classic signs of hypothyroidism. She's young for it to show up, but I'd check it out if it were me. @ILoveMyShiba, yeah that's puppy coat blowing! When the fur loosens and clumps together like that, it's ready to blow. You can brush him or gently pull on the tufts - if they are ready they'll come right off. @ILoveMyShiba - How old is Kobe? I ask since I still haven't seen Tali's coat blow as of yet and she's, I think, couple weeks older than Kobe from what I remember from your intro thread. She just hit 16 weeks and her fur LOOKS like adult fur and doesn't look like she's shedding all that much. At what age do pups generally start blowing their coat? @ILoveMyShiba - Haha, yeah, she's almost 17 weeks now so not too far off from Kobe. It's been a little cooler here so that's probably why. I've been just counting the days until my house, car, clothes, hair, mouth, etc is all furred up with both Tali and Nala's fur haha. It's been really cold in Virginia, it's supposed to be 2 degrees Fahrenheit tomorrow morning and that's almost too much for me. It's supposed to hit -15 with the wind chill here. I hate my dog right now. The other option is I take a job in SoCal and Banjo never sees snow again. That wouldn't be too fair for him. @BanjoTheBetaDog - or you could move further south where it's not AS cold, but still snows! Break out the lawn chairs and sunscreen....gonna be a balmy -4 in London tomorrow!! @nikkitine I took a golf trip to SF a few years ago and i got all 4 seasons in one day! @BanjoTheBetaDog - Hahaha, yup that definitely happens! But I like it up here because there's no real extreme in terms of weather. And also lots of dog-friendly places. @Nikkitine - Awesome, so I can stay with you when I move down there, right? And you can get me a job? :P I'd give up all the green tea in China for a warm season right now!! @Kira_Kira - I haven't shaved my legs in 1.5months (ain't got time to be impressing the S.O... I'm hibernating). I think I have maaaaybe 50 hairs. We weren't not built to keep in heat, lol! LOL I haven't shaved my legs since I was in high school. Yes on hairless Asians. I have about 2 lucky strands of hair on my legs! Well I'm half French, so that's where the extra 48 hairs come from, haha. I don't look Asian at all... I look more Hispanic or Native (much to my mother's disappointment, lol). My mother's Taiwanese, so she takes her "type" of Asian very seriously, haha. I'm a mutt. I'm 1/2 Vietnamese, 1/4 German, and 1/4 El Salvadorean. My fiance says that it's all the angry races, I say it's all the drinking races. Cheers! I agree with Asians taking their "type" very seriously. Asians are actually some of the most racist cultures against other Asians. People can never figure me out, the Asians and Spanish are like, she might be one of us and I get the most bizarre questions from people. Where are you from? D.C.
Wow you girls got wayyyyy off topic lol. Should make a thread for off topic chit chat!!! Can you drink? Cause I can't at ALL. I can half 1/2 glass of wine and be white-girl wasted. And I get super blotchy red all over, and that's always fun to explain. I just don't drink anymore, lol. I stood in my friend's (who is Guatemalan) family photo, just for fun, and weeks later people thought I was actually part of the family. I've successfully assimilated into their family. Great success. And I couldn't agree more about the racism thing... my mom is absolutely horrid. Hates the Chinese for what they did to Taiwan, hates the Japanese for the same reason, hates white people for being racist against us... but on the upside, she hates everybody equally! Hahaha I'm full on Chinese so I think we're probably the worst in terms of self-hatred. As I tell people, my family isn't racist, we just hate all people equally. Sorry @Bootz! We'll start somewhere else, lol. Just out of curiosity... are we even allowed to have a "random chit chat" thread? Is it frowned upon? There is a thread out there that is for introducing yourself, it has names and pictures of us versus just our dogs. Sorry @kira_kira but the Swedes sure must top the drinking people list, after the Finnish of course. Who will also win the sauna competition. Puppy coat + Summer (and a hot one at that) = massive coat blow. Completely normal. It could last several weeks, depending on the weather. Just keep brushing her daily, it seems like it never ends but it eventually will. Hi Everyone! When does a Shiba puppy usually start shedding? I am reading on here about young puppies shedding and my girl is not at all. She is 7 1/2 months old now. I don't know when I should prepare myself lol. Thanks and sorry for the silly question!